On February 20, 1865, the Confederate Congress authorized the recruitment of slaves into the army. Well, as we all know, the war ended only months later, but this leaves a haunting question. If Jefferson Davis had authorized the use of slaves, could the Confederacy have won the Civil War? Timeless questions arise as to the reasoning behind such actions. During the War Between the States, many military maneuvers were still very new. Trench warfare originated during the Civil War, as did the use of machine guns, hand grenades, and land mines. Submarines were newly invented, as were iron ships. The Civil War was the first time that troops were transported by way of railroads. So what took the Rebels so long to realize that they were going to lose the war if they didn’t instigate the use of slaves? At that time, 3/4 of the Southern population was black. If the South had promised freedom for slaves who fought for the Cause, perhaps the outcome would have been very different. Because insurrection by slaves had taken place only a few years previously in Virginia, it was probably enough to scare authorities into thinking that, should they enlist slaves, the blacks might turn against their masters. But the black Confederates who enlisted didn’t do as predicted. They fought nobly, and with honor. It’s only a wonder why there weren’t more of them. In honor of Black History Month, I thought it appropriate to talk about the part African-Americans played during the Civil War. Everyone knows that President Lincoln signed into law the Emancipation Proclamation on January 1, 1863. What they likely don’t know is that he had no intention to free slaves in northern states, or states that he had jurisdiction in. In fact, in his home state of Illinois, freed slaves were disallowed, and Lincoln did nothing to reverse the fact. On February 20, 1865, Conferate Congress authorized the arming of slaves. As we all know, it was too little too late, and the Confederacy crumbled months later. During the War Between the States, the Union army enlisted black soldiers. However, most of those poor guys were forced to hard labor, and didn’t engage in battles. By the war’s end, African Americans constituted less that one percent of the U.S. population, yet made up 10 percent of the Union army. Altogether, 180,000 black men enlisted, which was more than 85 percent of those eligible. On the Confederate side, General Patrick Cleburne advocated enlisting slaves to fight for the cause in return for their freedom. But after he was killed in 1864, the idea fizzled until it was again raised in November 1864 by President Jefferson Davis. The Confederate Congress authorized enlisting 300,000 black soldiers in March 1865, but the war ended the following month. Speculation arises that if the war had ended sooner, Lincoln probably would not have signed the Emancipation Proclamation into law. The Confederacy missed the opportunity to tap into their largest source of manpower, and were thus so outnumbered that they were doomed to fail. The Memphis City Council has finally taken positive steps to resolve the issue of renaming three Confederate themed parks. 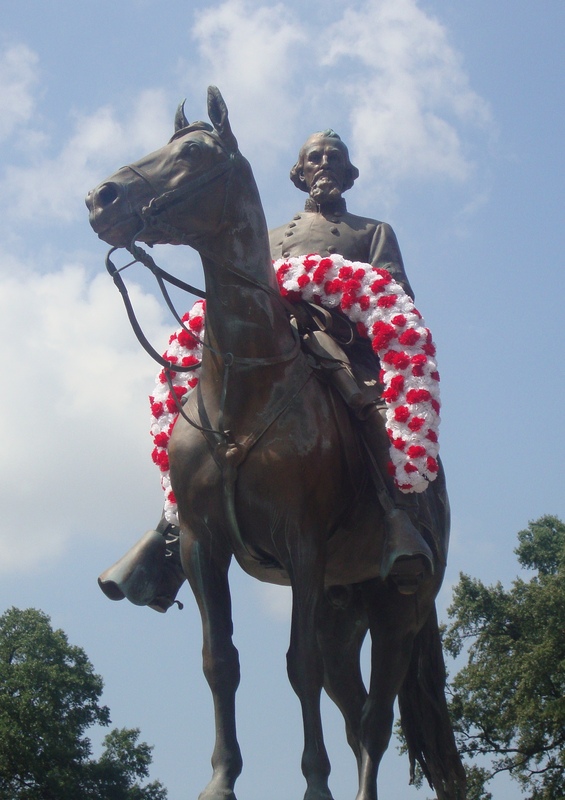 Yesterday, the Council appointed a seven member committee to look into the issue of renaming Confederate Park, Jefferson Davis Park, and Forrest Park, named after General Nathan Bedford Forrest. Channel 5 News reported that General Forrest was the “original” Grand Wizard of the Ku Klux Klan, which only adds to the misinformation that the City Council, and the community as a whole, is receiving. One of the members of the new committee is Jimmy Ogle, who was the previous deputy parks director, and is currently the chairman of the Shelby County Historical Commission. Along with Ogle, other members of the committee include Councilmen Bill Boyd and Harold Collins, NAACP president Rev. Keith Norman, Memphis city parks official Larry Smith, and professors Michael Robinson and Dr. Douglas Cupples. Councilman Bill Boyd was quoted as saying, “This is a good representative assembly of Memphians who are capable of providing a reasonable solution for recommendation to the Memphis City Council.” It is interesting that no women were chosen to serve on the committee, however. “Things seem to be spiraling downward on this, rather than leveling off and taking a common sense approach to it,” said Ogle. Perhaps the committee can accomplish a positive outcome for everyone involved. Let’s hope so. It took 148 years, but the state of Mississippi finally ratified the 13th Amendment to the U.S. Constitution, making it illegal to own slaves. The question is, why did it take so long? There are many examples where old laws have never been purged from the books. Some examples are that it is illegal in Missouri to drive with an uncaged bear, in Philadelphia, you are not allowed to put pretzels in a bag (based on an Act from 1760), in Colorado, a cat cannot be outside at night unless it has a taillight (what? ), and in Kentucky, a person must take a bath once a year or face prosecution. The 13th Amendment was written into law in 1865, immediately following the end of the War Between the States. However, many southern states, Mississippi included, refused to ratify the law. Those states that refused were forced into Reconstruction. It didn’t take long for Alabama, Georgia, and most other states to ratify the amendment, but for some reason, Mississippi held out. Fast forward to 1995, when it was discovered that the law STILL hadn’t been ratified. Remarkably, Mississippi lawmakers didn’t officially abolish slavery until that year. However, the state failed to notify the U. S. Archivist, so it was never official. The oversight might have never been discovered if it weren’t for Dr. Ranjan Batra, who is an associate professor at the University of Mississippi Medical Center. When Dr. Batra saw the movie “Lincoln,” he grew curious about what happened once the states voted on ratification. It was then that he learned of the clerical error, and the correct paperwork was filed on February 7. Secretary of State Delbert Hosemann admitted that “It was long overdue.” Ya think? (Grand) Wizard of the Saddle? After hearing about the Memphis City Council’s ridiculous motion to rename several parks in the city, the Ku Klux Klan has decided to take action. According to the Grand Wizard, the KKK will congregate in Forrest Park every week until the name is reverted back to its original. The controversy was sparked when Memphis City Council members decided to rename Forrest Park, which is named after famed Civil War Confederate General Nathan Bedford Forrest. The park is on the National Register of Historic Places, and General Forrest himself, along with his wife and grandson, are buried in the park. The new name for the park will tentatively be Health Sciences Park. The same goes for Confederate Park and Jefferson Davis Park, which are both located on the banks of the Mississippi River. Their new names will be Memphis Park and Mississippi River Park, respectively. City Council members wanted to rename the park because they said General Forrest was a slave trader, and was a Grand Wizard of the KKK. So much for doing their research. Although he was a slave trader prior to the war, he set his slaves free during the war, and some of his freed slaves even fought under him. He went out of his way to keep families together. He was never a Grand Wizard of the KKK, and denied being a member in public documents. He didn’t instigate the slaughter at Ft. Pillow, either, but City Council members don’t know that because they don’t do their homework. In fact, Forrest was found innocent by a Grand Jury, and the court records are available to the public. Union General William T. Sherman, who despised Forrest, even admitted that Forrest did no wrong, and therefore, could not be persecuted. Unfortunately, the KKK has decided to get involved, and vows to stage a rally in Forrest Park every week beginning in April or May. This writer is dead-set against it, because it will only create more racial tension. The last time the Klan was in Memphis, numerous riots broke out. I’ll bet that, if General Forrest was alive to see it, he would be deeply saddened. Memphis city council members managed to change the names of three historic parks today. One of them is Forrest Park, named after the famous Civil War Confederate General Nathan Bedford Forrest. Although Nashville lawmakers tried to intervene, Memphis city council members thumbed their noses at them, went ahead, and changed the names by a resolution, not an ordinance. City council members feared state legislators might pass legislation stopping any efforts to rename Forrest Park to Forrest Wells Park in honor of anti-lynching crusader Ida B. Wells. “Republicans in Nashville have no control over what we do,” council member Janis Fullilove snidely remarked. According to Channel 5 news, Forrest Park was “named after a one time wizard of the Ku Klux Klan.” It is no wonder there is controversy involved when the media doesn’t get the facts right and publicizes false information. Shame on you, Memphis. Now Forrest Park will be known as Health Sciences Park. Confederate Park downtown will hence be called Memphis Park, and Jefferson Davis Park, named after the president of the Confederacy, will be the Mississippi River Park. Shameful. To change names that are historically relevant is to attempt to change the course of history. What’s next? Changing the names of everything named after Abraham Lincoln? Because he was not the “Great Emancipator,” like he has been portrayed to be. News flash, kids! It is truly sad to see political correctness take precedence over historic significance. There is a chance that the parks can be renamed again, but according to city council members, the likelihood that the parks’ names will revert back to their originals isn’t very good because of the “controversy” surrounding them. Shame on you, Memphis. There is nothing controversial about it. You are banishing from public awareness the fact that many thousands of men and women died for a cause they believed in. It was a different time then, and people had different mindsets. To bury the past by pretending it didn’t exist is a horrendous exploitation of power. Shame on you, Memphis. And speaking of being buried, the remains of the great General Nathan Bedford Forrest and his wife are buried beneath a statue of Forrest on his steed in the park. According to the city council, they don’t care if the statue remains in Forrest, I mean, Health Sciences Park. Yeah, right. At least, not for now. No resolution about that topic has been discussed yet. Shame on you, Memphis. Your disrespect is appalling. Recently, The Civil War Trust, which is America’s largest nonprofit battlefield preservation group, secured a contract with a property owner to obtain 61 acres of Fleetwood Hill. The hill is a significant part of the Brandy Station Battlefield which, on June 9, 1863, became the site of the largest cavalry battle to ever take place on North American soil. The CWT plans to eventually preserve the entire battlefield site. So far, its efforts have secured 1,800 acres of Brandy Station – more land than at any other battlefield in the country. Right now, houses dot the landscape of what was once a pre-Gettysburg contest between Confederate Major General J. E. B. Stuart’s troopers and Union Major General Alfred Pleasonton’s men. Approximately 20,000 troopers fought it out, and about 1,000 died, were wounded or went missing. Right now, the main goal is to raise the $3.6 million required to secure the land. Music played a significant role in the War Between the States. The South had a battle song, “Dixie,” so the North wanted its own as well. In 1862, a year into the war, Julia Ward Howe came up with new lyrics to a melody that was already familiar, “John Brown’s Body.” Ironically, her husband, Dr. Samuel Howe, was a financial supporter of the raid at Harper’s Ferry, where John Brown was captured and hung for treason. Both he and his wife were staunch abolitionists. Mrs. Howe was inspired to write “The Battle Hymn of the Republic” after visiting Washington D.C. and witnessing Union soldiers’ campfires flickering on the outskirts of town. At the time, the song was considered inspirational in its religious references. Mrs. Howe was a member of the Unitarian Church,which is said to be more atheistic in their beliefs. This held true for Mrs. Howe as well. The strong sentiment and symbolic overtones in the lyrics she wrote are indicative of the hatred she apparently felt for Southerners in general; not just toward Confederates. This song is commonly sung in churches and at patriotic events today. However, the problem arises when one considers the lyrics. They will find that “The Battle Hymn of the Republic” is hate-filled rhetoric consisting of derogatory implications. It is no wonder that people realize the negative aspects and refuse to sing the anthem. It is interesting to note that the song is performed frequently at Southern churches within the Bible Belt. “He is trampling out the vintage where the grapes of wrath are stored” is one example of a symbolic reference – vintage representing the blood of Southern people. When a song becomes controversial, it is generally avoided, and many in the South feel this sentiment. Just as African-Americans have for centuries fought to acquire respect and equality, it seems only fair that any song deemed offensive by any group such as “The Battle Hymn of the Republic” should be discontinued as well.